The residential and commercial creative design possibilities are endless when you use an ethanol fireplace burner. Create a unique atmosphere mixing comfort and design. Our collection of premium fireplaces are ideal for creating stunning walls or cabinetry features. To customise a fire feature for your residential or commercial project, simply decide on the direction of your opening, choose how many sides you want to see the flame from, then customise it with a decorative side box (or not). Fireplace grates are an innovative & durable heating solution that can transform your traditional wood fire into a contemporary, eco-friendly ethanol fireplace. Available in different shapes, sizes and finishes, you're guaranteed to make memories around our ethanol indoor and outdoor fire pits. More than accents, our versatile fire tables provide a welcoming destination and make entertaining ever so easy. An ever-evolving collection of design ethanol fireplaces that will transform your home and warm your heart. 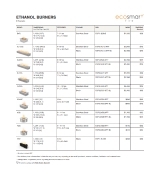 Our fireplace parts and accessories have been designed to improve the safety of operating an open ethanol fireplace.